I love candy soooooo lets talk about it! hahaha! 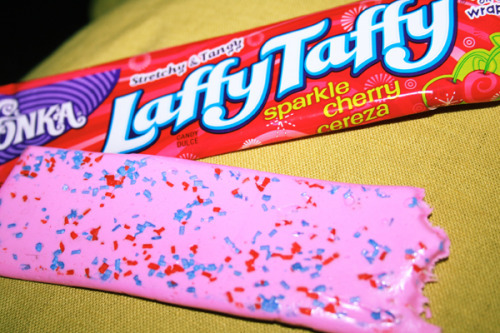 I have MANY favorites but my all-time favorites are: Skittles and Laffy Taffy! My favourite candy of all time is Jelly Beans (or as we call here in Brazil: Jujubas) *-* I like it more than I like chocolate, for real!! I really love white chocolate best. I eat Nutella out of the jar and I buy a lot of chocolate. Gotta have something to snack while I'm reading, no? My favorite candy is ANY. although there are couple of things that are just too sweet or disgustingly sweet but I can't remember what are those atm. One of my favorites are Milka, Toblerone and Kinder. 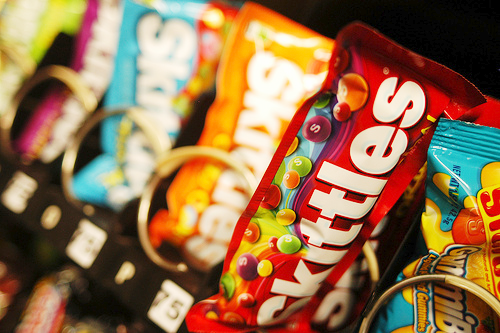 :Q____________________ Oh and Skittles and M&Ms. I promised myself that as soon as I move to America, I'll buy every single American candy that I didn't have a chance to try and lock myself into my house and eat everything until I OD on sugar. I'd do that now but it's no fun. I am also not crazy about Nutella either, Jenny. Hey hey, I love it! Nutella, Kinder and those acid little sugar covered snakes Lex posted! Wow, really? It's soo good on bread! Have you guys tried those All Flavor-Beans? There are some real crazy flavors, but they are so "fun" to eat. Hehe some of them really are, like the vomit and dog food ones! Just gross! But I loved the tooth-paste one! Yes, those are the ones, hehe. They are disgusting indeed, but not all of them. But the vomit one is just... ugh. i always liked you, ken. Subject: Re: What is your favorite candy?